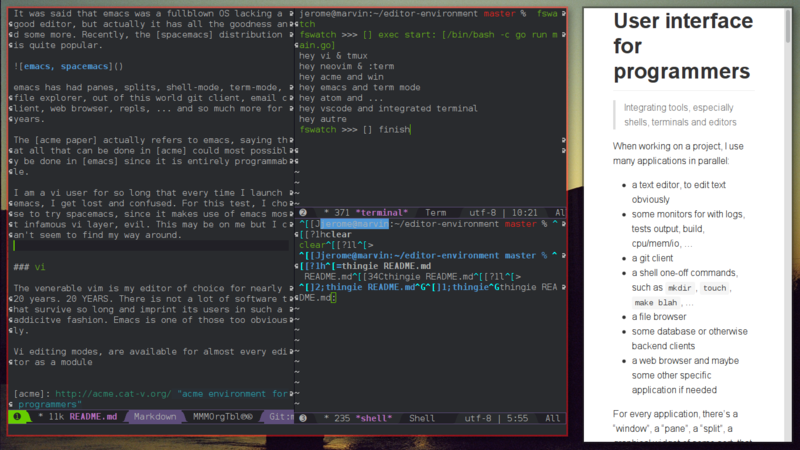 Integrating tools, especially shells, terminals and editors to achieve the common programmer’s tasks. inspect the programs data, in/out, files, database, etc. For every task, there’s a “interactive graphical representation” in the form of a “window” that is either visible or hidden to the programmer who has to switch between them, to re-arrange them or have them interacting. 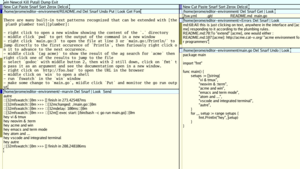 A hybrid of window system, shell, and editor, Acme gives text-oriented applications a clean, expressive, and consistent style of interaction. See acme, watch a tour of acme by Russ Cox and maybe read the original paper by Rob Pike. The paper and the great man pages covers a lot of what I will be writing about. From the man page acme(1): > Acme manages windows of text that may be edited interactively or by external programs. The interactive interface uses the keyboard and mouse; external programs use a set of files served by acme; these are discussed in acme(4). acme features a text user interface, an environment that allows to edit text, whether it’s a file, a shell, a file listing, a live log output, the tags… The whole interface is textual, editable and “clickable”. Using acme is a refreshing and yet bitter sweet experience as it packs such goodness only to lack what seems so familiar to many. 3-right click main.go:3 to open the file at line 3 or main.go:/Println to jump/open directly to the first occurence of Println in the file named main.go, then 3-right click again to advance to the next occurence. select godoc with button 2-middle, then with 2-middle still down, click on fmt to pass it as an argument and see the documentation open in a new window. All this is just clicking on text, anywhere in the interface and acme responding to it according to the plumbing rules. acme shines as an environment for programmers, thanks to its unique set of features, its consistency, its easy integration to the surrounding system and its approach to interactions between tasks. Russ Cox coined the term “Integrating Developer Environment”. 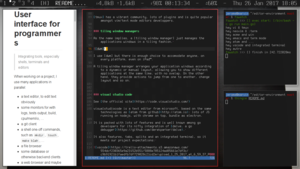 NB: I use vi in st terminals in a tiling window manager on debian linux on a thinkpad, with or without external displays, with or without external mouse and keyboard. that allows easy selection of patterns such as ^some/path/to/file:line:col. I find it convenient to only use (space) as the word delimiter in st.
tmux is a terminal multiplexer that allows to run shells within a session, with tabs, panes, searchable buffer, attach-detach, … just like [GNU screen], with a somehow more modern implementation. It is particularly interesting when working on a remote server via ssh/mosh, for pair programming for instance. 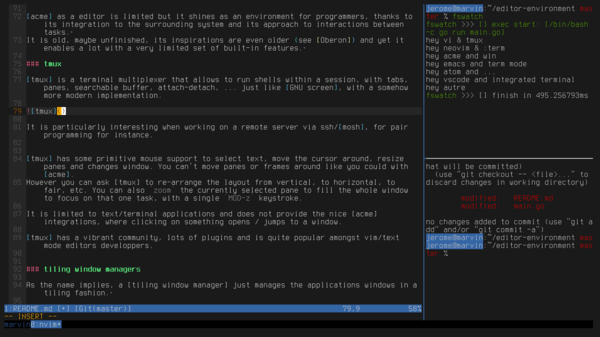 tmux has mouse support to select text, move the cursor around, resize panes and changes window. You can’t move panes or frames around like you could with acme. The latest version to date (2.4) handles more events (click, double click, triple clicks, drag) which can be bound to user defined actions. 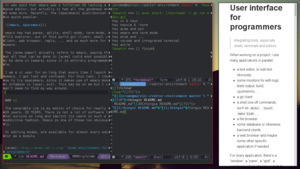 You can ask tmux to re-arrange the layout from vertical, to horizontal, to fair, etc. You can also zoom the currently selected pane to fill the whole window to focus on that one task, with a single MOD-z keystroke. 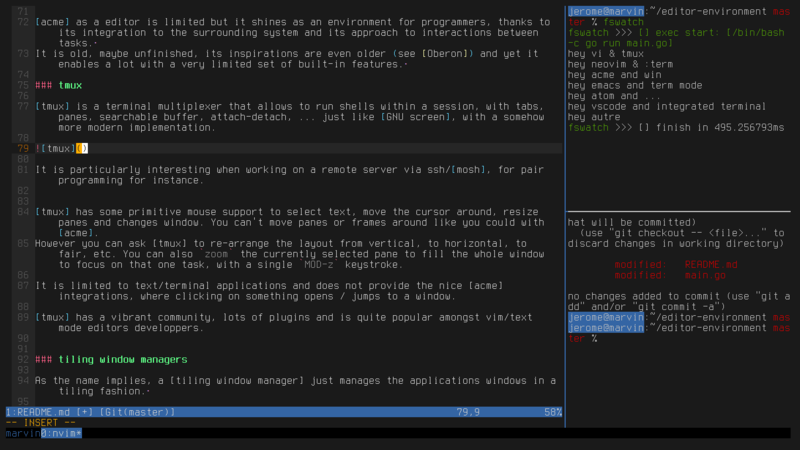 tmux offers a nice “tiled” terminal environment, with potentially more featureful shells and terminals, searchable scrollback. in conjunction with a plumb.sh script that either call vim or vim --remote or xdg-open. 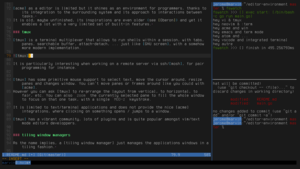 As the name implies, a tiling window manager just manages windows in a tiling fashion. I use dwm but there is enough choice to accomodate anyone, on every platform, even on iPad™. 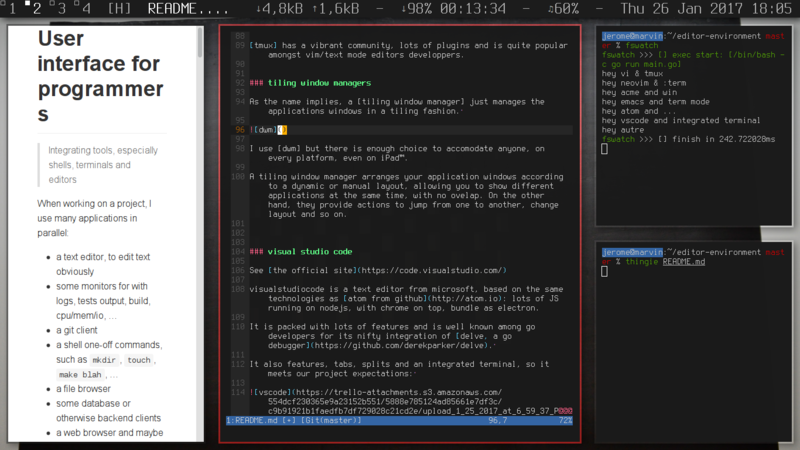 A tiling window manager arranges your application windows according to a dynamic or manual layout, allowing you to show different applications at the same time, with no ovelap. On the other hand, they provide actions to jump from one to another, change layout and so on. In the context of multiple displays, window managers brings event more control over the actual layout of applications across your setup, where tmux, acme and other single window applications come short. They are of course not limited to text applications and provide a good foundation for whatever you choose to run within, may it be acme and tmux. Since I use the suckless simple terminal, I hacked a little patch that provides the “right click to plumb” feature I missed so much from acme. See the patch section of st. The venerable vi has been my editor of choice for nearly 20 years. 20 YEARS. in neovim, via vte. Terms in neovim are quite close to acme’s win program (which source is located in plan9’s src/cmd/9term/win): editable, using the same keyboard features. 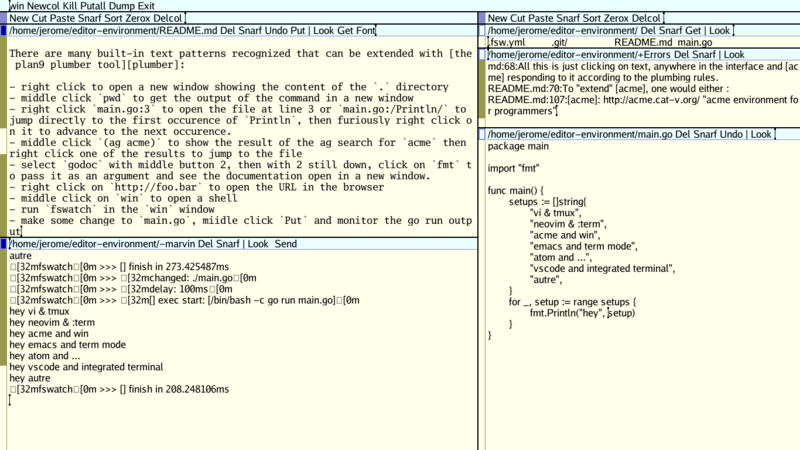 vim has --remote and neovim has nvim-remote that allows to send commands to a running vim server.